It wasn’t that long ago that sports were near impossible to stream and forced people to keep their expensive cable bills. With cord cutting increasing in popularity every year, watching sports without cable has become much easier. The NFL in particular is one of the easiest sports to watch without cable including the 2019 NFL Playoffs. In fact, not only can you watch the NFL playoffs without cable, you can do so for free thanks to modern over the air antennas. We’ll show you how to figure out if you can pick up the required channels with an antenna and if not, we’ll also show you the other streaming options that will have the games. What do I need to use one of these services? Since there are multiple channels that air the different playoff games, the first thing we need to do to stream the 2019 NFL Playoffs is figure out exactly what channels we need. All of the times below are in Easter Standard Time. You can view our guide on how to watch the 2019 Super Bowl without cable for more specific information about the Super Bowl. It’ll show you how to watch the games for free even easier than with an antenna. Now that we know what channel the games are on we can figure out the best streaming option available. According to the schedule above, the channels we need are CBS, FOX, and NBC in order to watch all of the different games. There are a few streaming services that offer these channels (plus more!) including YouTube TV, Hulu with Live TV, and fuboTV. Before we outline the different services that carry the NFL Playoffs, it’s important to understand what these services are. If you have Netflix or Hulu for on demand content, these live TV streaming services function the same way but offer live cable TV instead. The TV channels play the same exact content that you’d get without cable, they just cost a heck of a lot less! All of them are month-to-month without a contract and can be cancelled at any time. You also get to get rid of any expensive hardware rentals that you’re stuck with when you have cable. Although you’ll be able to cut cable by getting a streaming service, you will still need internet. The first thing people say when tell them that is how they’re currently enrolled in a “bundle deal” and are getting cable for a discounted rate. Bundle deals are a marketing scheme by the cable companies and are far more expensive than standalone internet and a streaming service. Since cable companies don’t really want you to know about their cheaper options, figuring out the best standalone internet can be difficult. Thankfully, there are a lot of really helpful tools online that help dig through the muck. 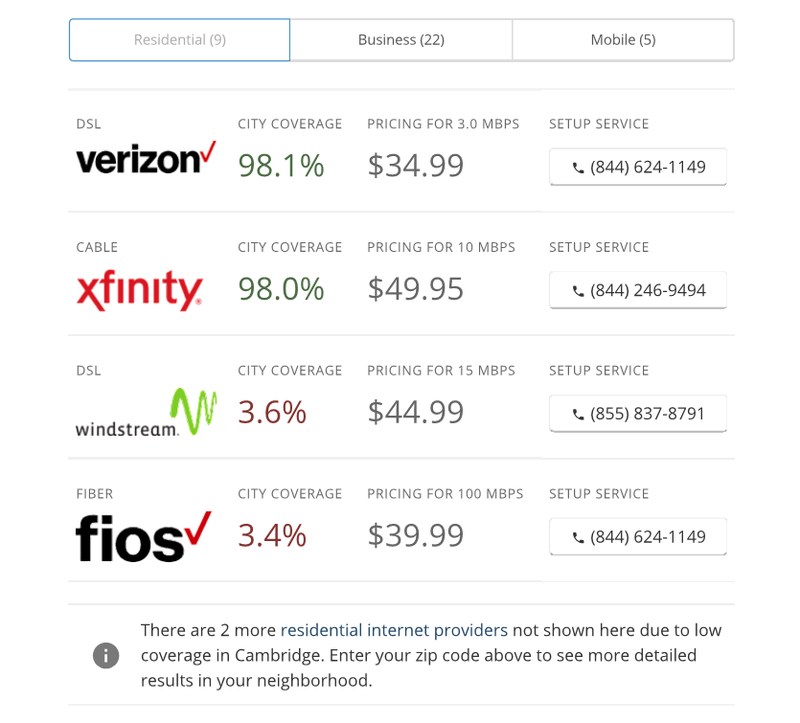 Our how to get internet without cable guide helps to explain our favorite free tool, Broadbandnow, and will show you have to get cheaper internet. Besides internet, the second thing you need to use a streaming service is a streaming device. A streaming device is basically a small computer that plugs into the back of your TV and allows it play apps for different services. You can think of it as a cord cutter’s cable box, but is a small one time fee to own instead of taking a second mortgage. There are a lot of streaming devices on the market and not every device works with every service. We’ll list all of the compatible devices below each service’s section of this article to make sure you choose one that works. 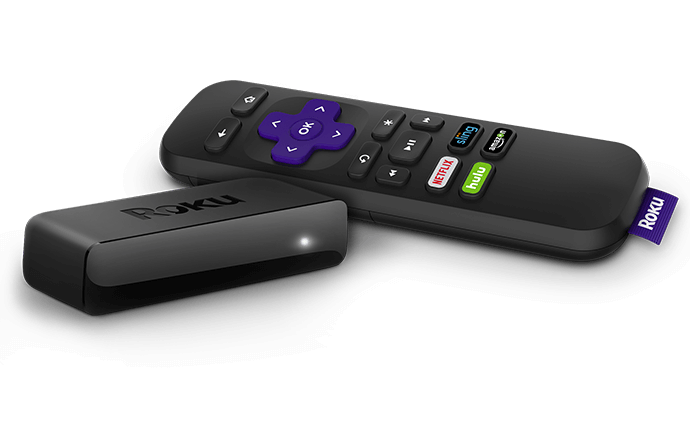 If you’d like a quick recommendation, a Roku device works with all three services in this guide and is the one we recommend to beginners and long-time cord cutters alike. 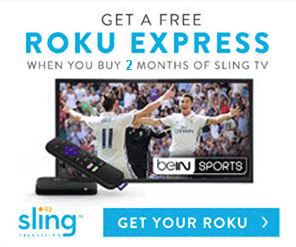 Roku devices are reliable, cheap, and incredibly easy to use. They’ve been around for a long time and have used that time to continue to improve their software. Roku has even started to be pre-programmed into a lot of smart TVs showing how well the software works. If you have a Roku TV, or another Smart TV that can play apps, make sure to check to see if you need a streaming device at all of if your TV can handle it. If you’ve been on the internet in the last decade you’ve probably heard of YouTube. Everyone’s favorite website for finding cat videos has recently stepped into the live streaming game in a big way. For $40 a month, YouTube TV lets you watch live cable TV channels without a cable subscription. YouTube has been pushing YouTube TV and there’s a good chance you’ve seen an ad or two for it while watching videos lately. If not, maybe you noticed that YouTube TV was the main sponsor of the 2018 World Series. Either way, it’s a fantastic service and deserves a deeper look. 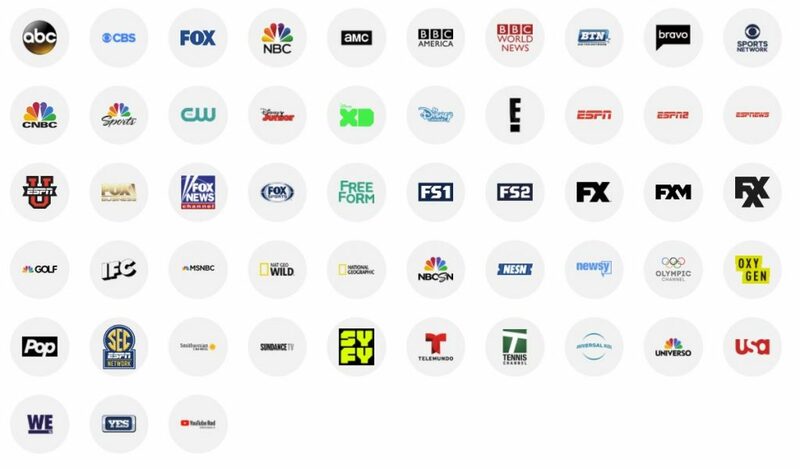 YouTube TV has a single package that offers over 60 channels for only $40 a month. While not quite as customizable as other services, YouTube TV’s package is full of high quality channels that will make most cord cutters happy. Including local stations, major sports channels, and plenty of other popular networks helps make the package a “one size fits all” without feeling like you’re missing out or over paying. The image below shows the current YouTube TV channel lineup for our Boston location. Since YouTube TV includes local networks, make sure to put your address into their website to confirm channel availability at your location before signing up. In addition to their 60+ stations, YouTube TV has a few features that help it stand out from its competitors. The first one that blows most of the competition out of the water is their incredible DVR. Being a major video hosting company has its perks and YouTube made sure their subscribers benefit from it. The YouTube TV DVR allows you to record unlimited shows to watch at your leisure. Unlimited recording isn’t the only feature that helps YouTube TV stand out in the crowd. YouTube TV also allows for up to 3 simultaneous streams from multiple devices and up to 6 different profiles per household. If you’ve ever tried to share a profile with someone, it’s really easy to understand how useful 6 different profiles can be. Like most streaming services, YouTube TV offers a free trial that will let you experience the software first hand before committing to a full month. Once the 7 day free trial is over, you’ll be billed the $35 on a month to month basis. Don’t forget to have a device ready if you want to watch your free trial on a TV before signing up! Note: YouTube TV is NOT available naively on the Amazon Fire Stick. There has been a lot of bickering between Amazon and Google and Google has pulled YouTube apps off the fire devices. If you’re familiar with streaming services, there’s a good chance you’ve heard of Hulu. Hulu is one of the biggest streaming services and is the major competitor to Netflix. However, unlike Netflix, Hulu has stepped into the live TV streaming game in addition to their on demand and original offerings. Hulu with Live TV is a different service than normal Hulu and isn’t included with your current account. Although you’ll still get access to the massive on demand library that Hulu offers, you’ll also get over 65 of the same live TV channels you get with cable. You’ll be able to pick up CBS, Fox, and NBC to watch the NFL Playoffs as well as plenty of other sports and non-sports related networks. The image below shows the current Hulu with Live TV channel lineup for our Boston location. Please make sure to check the Hulu website and put in your own zip code to confirm local channel availability before subscribing. As you can see, Hulu with Live TV offers a package that is fairly similar to YouTube TV. Both have a single package that aims to be “one size fits all”. Like Youtube TV, Hulu with Live TV allows you to add on premium stations like HBO, STARZ, and CINEMAX, but don’t allow for flexibility beyond that. While Hulu with Live TV doesn’t have the same DVR capabilities of YouTube, it does come with something that YouTube doesn’t; it’s on demand library. Hulu has over 20 million US subscribers watching everything from King of the Hill to new episodes of The Handmaiden’s Tale. One benefit of the on-demand library is that it’s sort of like pseudo additional channels. There are a lot of shows that Hulu adds to its on-demand library that can be watched even if the channel isn’t offered through their live TV service. They might not be live, but watching most shows a day late isn’t the end of the world. If you’re looking to watch sports without cable, fuboTV likely has you covered.Their entire service is based on the ability to stream sports, and they do it well. Although slightly more expensive than the two previous services, fuboTV is worth the extra $5 a month if you plan to watch a lot of sports. For $44.99 a month, fuboTV gives you access to over 70 channels including the FOX Sports stations, PAC 12 stations, Big Ten Network and plenty of others. Although fuboTV is a sports-first service, it’s not a sports-only service. FuboTV carries many of the popular cable networks that the non-sports fans of the family can enjoy too.. The table below shows the current fuboTV channel lineup for our Boston location. 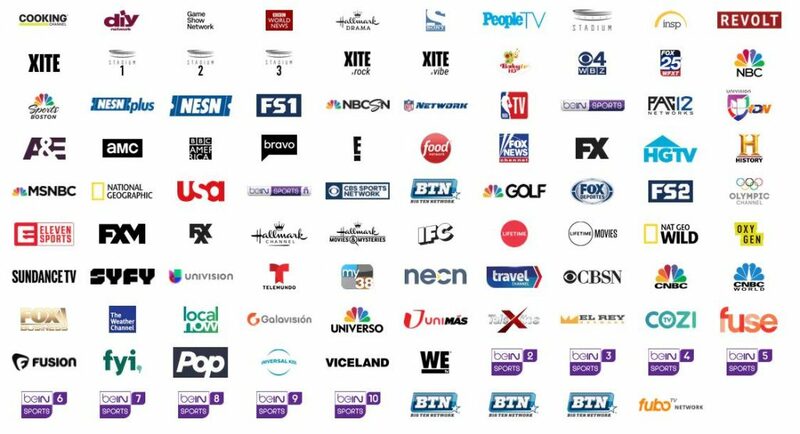 Due to local channel availability, make sure to put your zip code into the fuboTV website to confirm your channel lineup has the local channels you’re looking for. If the fuboTV base package of 75+ channels isn’t enough, fuboTV does offer something that the previous two services don’t. They offer a slightly bigger package for $5 more a month that bumps the channel count to over 90. This package is called the fubo Extra package and it’s current channel lineup is below. Although fuboTV has a significant amount of stations that play sports, it’s really important for us to mention a certain sports network that fuboTV does not carry. FuboTV DOES NOT have the ESPN or any other Disney-owned channels. ESPN is an expensive channel for services to offer and fuboTV has stated they plan to add it in the future, but not currently. Even though ESPN is one of the most popular sports channels, fuboTV still offers plenty of sports.